We’re supposed to go to the doctor at least once a year for a check-up and to the dentist twice a year to get those teeth checked out. These visits will help catch problems early and make sure that our bodies are running as they should be. My wife’s car – I had a bunch of issues pop up last year, ranging from tires to tie rods, so my car spent quite a bit of time getting looked over by the pros. My wife’s car has run very well, but it’s still old enough (nearly 7 years) and has enough miles (65,000), that I’d like to have a pro look it over and make sure everything looks good. This is especially true since we use her vehicle to tow our camper. As it turned out, the problem we had with my car regarding the tie rods was not even the problem I took it in for, but it would have presented a huge safety risk had I not gotten it taken care of. I’d like to make sure we don’t run the risk of something bad happening or a costly repair that might be avoided with a preventative check. Lawn mower – I take the mower to the repair shop every couple of years to get it looked at. During the in-between years, I will change the oil, but it’s nice to have the experts look at it, make sure everything is running right, sharpen or replace the blades, and just ensure that it will be in good working order. Our heating and cooling system – We had a scare last year where a twig almost burned out our air conditioning compressor, which has had me thinking about getting our heating and cooling system checked out. This became a ‘must do’ when, last week, our furnace had some sort of an event. I woke up on a very cold morning and could instantly tell that the house was cooler than it should be. Sure enough, the furnace wasn’t working. We have a little LED indicator that blinks in certain patterns that you can match up with a list on a sticker attached to the furnace. Ours was blinking something to do with a pressure valve that either failed or was stuck open. It did say that high winds, causing a downdraft, could be the culprit. We did have some above average winds the night before, and resetting the power to the furnace did seem to clear it up, and it’s run fine since, but nonetheless I’d like to get it looked at to make sure all is clean and in order. The biggest key we have for all of these is a trusted source. I have a mechanic that I’ve taken our car to when it’s had problems, and I’ll take it there for the checkup. There’s a local repair shop that we have used for our mower for years, and our heating and cooling checkup will be done by a company that I’ve had before, which was recommended by my parents as they installed a new heating and cooling system. I’m comfortable with all three services to believe that they’ll shoot straight, and I won’t feel like anything they tell me is a hoax or an exaggeration. What are some of the things around your neck of the woods that are scheduled for their ‘check-up’? I’m always amazed at how much better my lawnmower works (and how much nicer my lawn looks) after I sharpen my blade. Then, I’m amazed at how long I go between sharpenings even though my neighbor has the equipment to do it and it literally takes only a few minutes. Which reminds me, Spring is coming up…. lol. I’ve thought about just buying my own tool and learning how to sharpen the blade. I agree, it makes a huge difference and it means less work for the mower. Our HVAC is due to for a check up and by the end of the summer so will my car. Other than that though, everything else is in good shape. I’m just hoping the HVAC is OK. It’s old and I know we are going to have to replace it sooner rather than later. Mr. LH takes care of all the maintenance issues around here and he does a fine job. The car is probably the biggest maintenance issue. But he also takes apart our fans to clean and oil them as well as changing out filters in for our air and water filter. Taking care of things ensures you won’t have to replace them as quickly. By the way, I like the new design of your site. The new design should only show up on mobile devices. When you left this, I was still getting the old design on some mobile pages and the new design on some non-mobile devices. I adjusted some settings in my cache software, so hopefully it delivers the right look to the right browsers. If you see anything otherwise, please let me know! Oh wait. The site now looks the same as before – the style sheet must have taken a few minutes to load. Our HVAC is also due for a checkup. I have a home warranty plan that includes this so all I have to do is call to schedule. I’ve also been painting the exterior of the house the past several days. Lots of prep work but it is looking good. Love the feeling of accomplishing a DIY project! Wow, we still have snow on the ground, so no outdoor painting here for awhile! Maintenance is the key to having long lasting equipment. Buy two blades, sharpen one when you have time and just switch them. 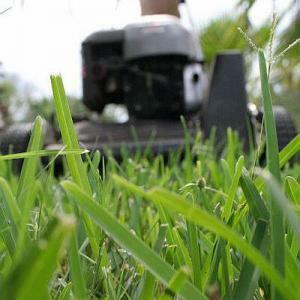 Use a 4″ grinder and a sand paper wheel to sharpen the lawn mower blades. If you look online, it may be cheaper to buy new blades than sharpen them at a shop. Interesting, I will have to do some cost comparisons. Thanks for the tip! Ugh we have a bunch of stuff coming up too, car was just done (oil change, tires and wipers) but also have MVI on the horizon….our home needs a few things too. Normally this time of year I have to check that the drains aren’t clogged up with leaves and pools of water. This winter has been so dry that I haven’t had to do that this year. But it’s time to clean the coils on the fridge and do some hard to reach dusting. I do set aside a budget for maintenance of my things. We never know an emergency with our stuffs especially those that are very useful to us like the car. It would be a big hassle to commute.